Ed. 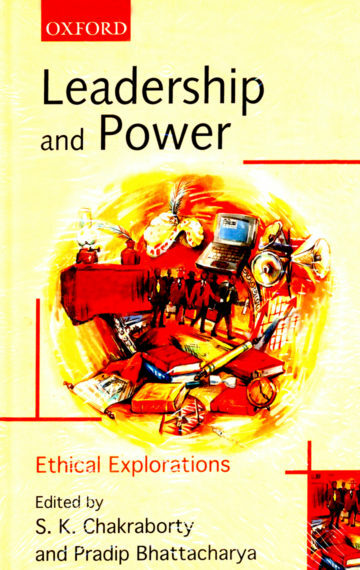 Leadership & Power: Ethical Explorations (with Dr. S.K. Chakraborty). OUP, New Delhi. 2001. “An assorted yet well marshalled collection of papers makes an intellectually stimulating reading.” V. Prasanna Bhat in Business Line. “This compilation (comes) at a time when materialism, commercialisation of education and research have devoured almost the whole of traditional wisdom. Theirs is an attempt to examine the problem, make a list of the diseases and suggest remedies in the light of earlier experiences. The contributors were given wide freedom, and since they come from a variety of work-areas, Leadership and Power has shaped itself into a double-jointed inter-disciplinary tool. There is a charming variety of subjects and style…When seen in balance, the twenty-nine papers in the collection usually zero in on either political power or corporate power and discuss the tremendous pressure upon a leader in either of these areas. So many authors leading us on Himalayan treks helping us look at the blossoms and thorny bushes on the pathway, the gurgling stream flowing close by, the strips of waterfalls that make you blink, the dangerous gorges on the sides and the beckoning peaks of achievement beyond. This elevating and practical adventure has been given a visual kick-start by Pradeep Nayak who has placed the leaders and their instruments of power in a capsule and whirled it into the space on the cover. Indeed Leadership and Power sets awhirl significant ideas and makes us think that transformation is possible. Transformation of a misused present into a worthy future. Yad bhaavam tad bhavati.”—Dr. Prema Nandakumar in BIBLIO. “In their book, Chakraborty and Bhattacharya have compiled a wide selection of perspectives on power. Twenty-nine diverse pieces…enriching material…from different parts of the world and from different fields and professions. The articles are thought-provoking and deal with real issues we are faced with on a day to day basis. On several levels the material in the articles is rich…have a high degree of authenticity about them…There is also a high degree of scholarship in many of the articles with myriad references from many renowned sources and personalities…the articles are a rich source with which to glimpse many aspects of power…in reading these pieces many questions arise which, when worked through, facilitate the emergence of a framework for power.” Pravir Malik in Mother India.